The Boston University track & field teams began their 2015 indoor season Saturday as hosts of the BU Season Opener at the Track and Tennis Center. Although the event did not have a clear winner due to the absence of a team points system among the participating schools, a number of Terriers won individual events. For the men, senior David Lagerberg impressed, finishing first in the 500 meter dash with a time of 1:03.94. The Nottinghamshire, England, native set a new personal best with this time. Junior Cameron Williams also started strong, coming in first in the 300 meter dash with a time of 34:37. Junior Justin Flynn finished just behind Williams, taking second with a 34:84 mark. In the 4×400 meter relay, a team of Lagerberg, sophomore Cameron Nurse, freshman Robie Webster and sophomore Peter Katsarakes crossed the finish line second (3:17.95). Reigning Patriot League Male Field Athlete of the Year, junior David Oluwadara, won the triple jump (15.17 meters) and later placed third in the long jump (6.64 meters). On the women’s side, junior Toria Levy placed second in the 60 meter hurdles, finishing with a time of 8.80. Senior Jade Paul finished third in the 800 meter run (2:14.66). Meanwhile, classmate Christy Wood came in fourth in the 300 meter dash (39.25). The men’s and women’s track teams will have more than a month off before they return to action on Jan. 21 when they host the Multi-Team Meet. The swimming and diving teams, competing in their season’s first quad Saturday at Rutgers University, had mixed results. The women’s team emerged victorious against the University of Connecticut, while the men lost to both Yale University and UConn. 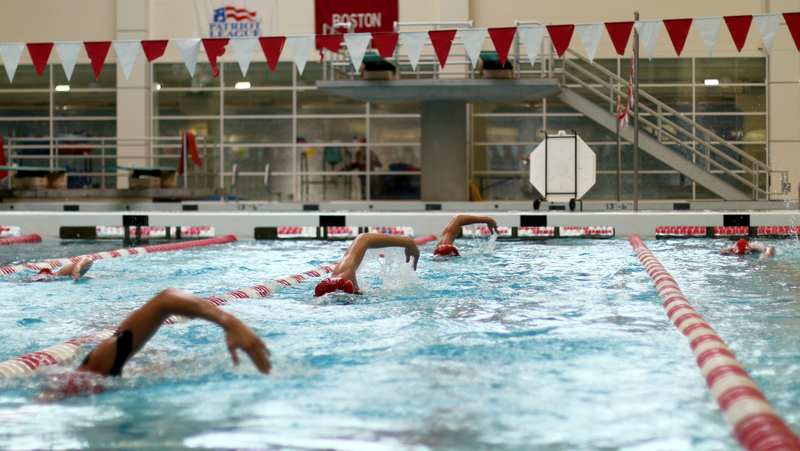 Between the two teams, the Terriers had seven first-place finishes on the afternoon. Sophomore Garrett Chin impressed for the men’s team with three victories on the day. The La Canada, California, native took first in the 200 meter and 400 meter individual medleys and the 200 meter butterfly, during which he set a personal-best time — beating his previous best by nearly two seconds (1:49.78). He totaled 11 top-three finishes for BU. Freshman Trevor Winans also shined, winning the 500 meter freestyle and taking second in the 1000 meter freestyle, where he too set a personal-record time (9:38.51). Closing out the men’s contingent was sophomore Zack Woo, who set a personal-best time of 2:09.24 in the 200 meter breaststroke, good for a sixth-place finish. The women’s team registered 14 top-three finishes on the day. Both freshman Julimar Avila and junior Isabella Olivares set personal records. Avila took the 50 meter freestyle sprint (23.94), and Olivares finished third in the 100 meter backstroke (57.50). In addition to Avila, classmate Erin Nabney came away victorious in the 200 meter individual medley with a time of 2:05.95. The swimming and diving teams will also wait until 2016 for their next meet, when they head to Colgate University on Jan. 9.